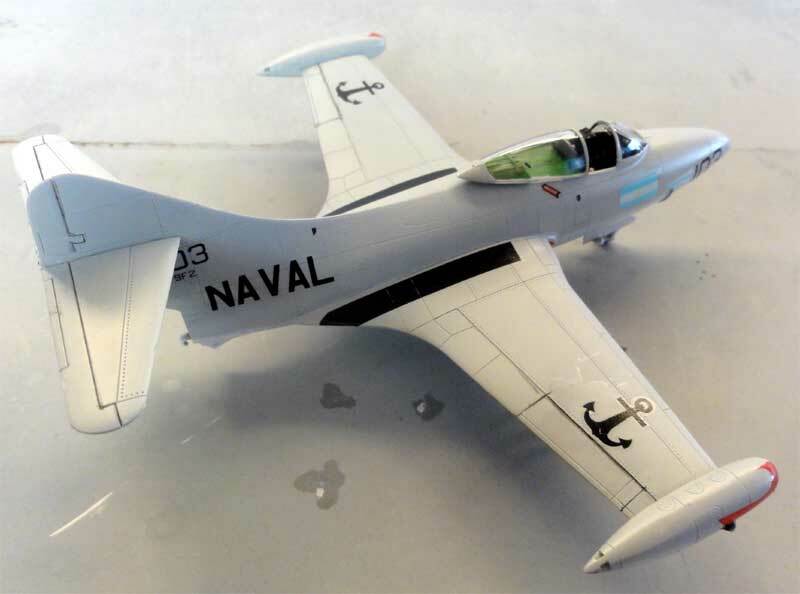 The Grumman F9F-2 was designed as shipboard carrier based fighter in the nineteen-forties. 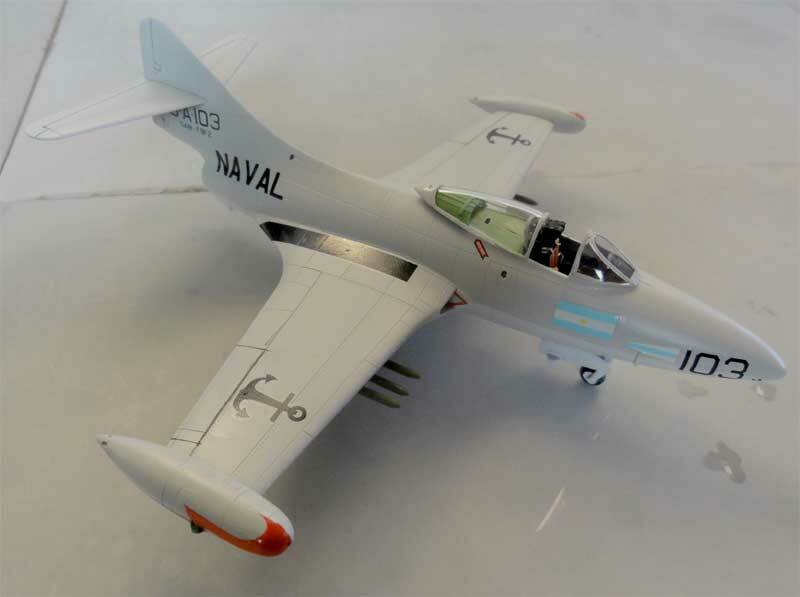 It was one of the first successful U.S Navy aircraft with a jet engine. It was also used during the Korea War. 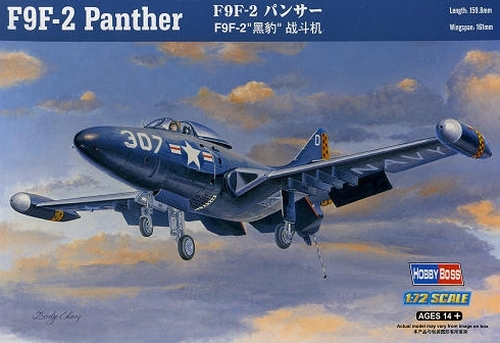 This Hobbyboss kit of the F9F-2 Panther (kit no. 87248) was released in 2011 and has about 90 parts on 2 sprues and 1 sprue for the weaponry and a clear sprue. 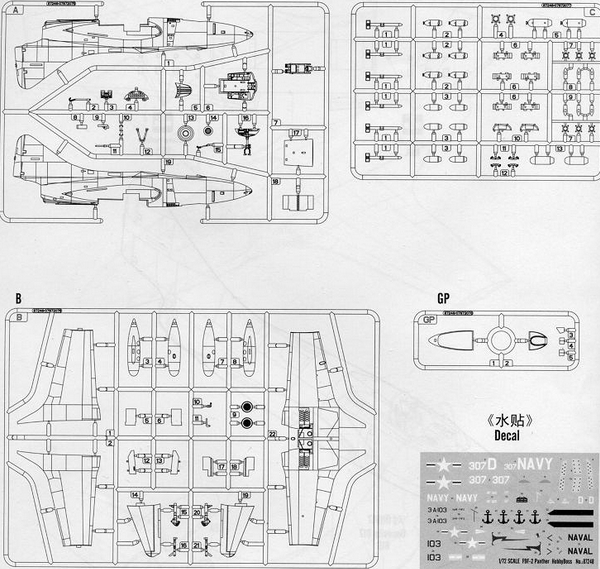 (The only other 1/72 kit was the old one from Hasegawa). 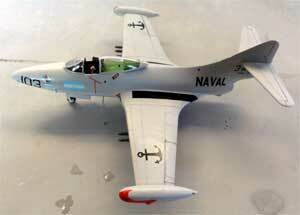 - Argentina Aeronaval as flown from Punta Indio in 1960 with "NAVAL" markings. 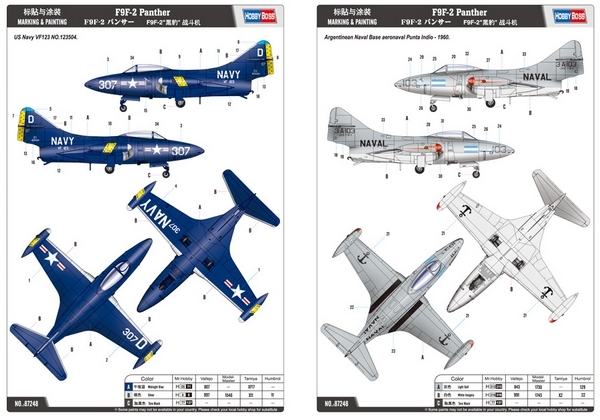 The stencilling on the decal sheet is a bit limited, on some U.S Navy aircraft small with stencilling was often applied. I opted the Argentian scheme, a nice addition to my World Air Forces collection. The Hobbyboss kit was assembled rather straight forward as per instructions. There is adequate detail in small wheel bays and cockpit with a reasonable ejection seat. 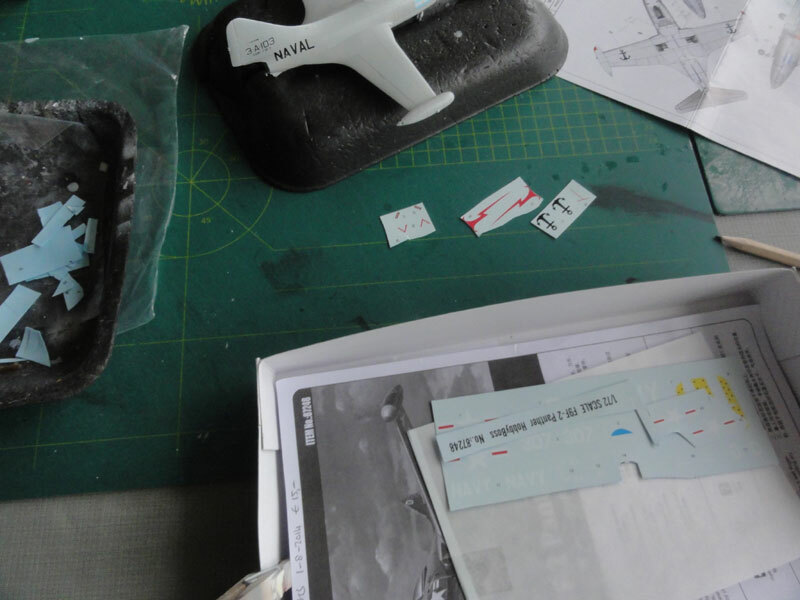 There are also parts for weapons with a few unguided rockets and bombs and for the pylons, holes need to be opened up in the lower wing. The aileron and flap demarcations on the lower wing were vague, I inscribed these with a scriber. Assembly started as expected with the cockpit. The cockpit interior was painted inside dark gull grey for the Argentina Panther (on a U.S NAVY aircraft it was probably interior green until a first major overhaul). The wing intakes are there but I added a piece of card inside to direct it towards the engine. I added a lot of weight in the nose to prevent tail-sitting (so not needing part A11). 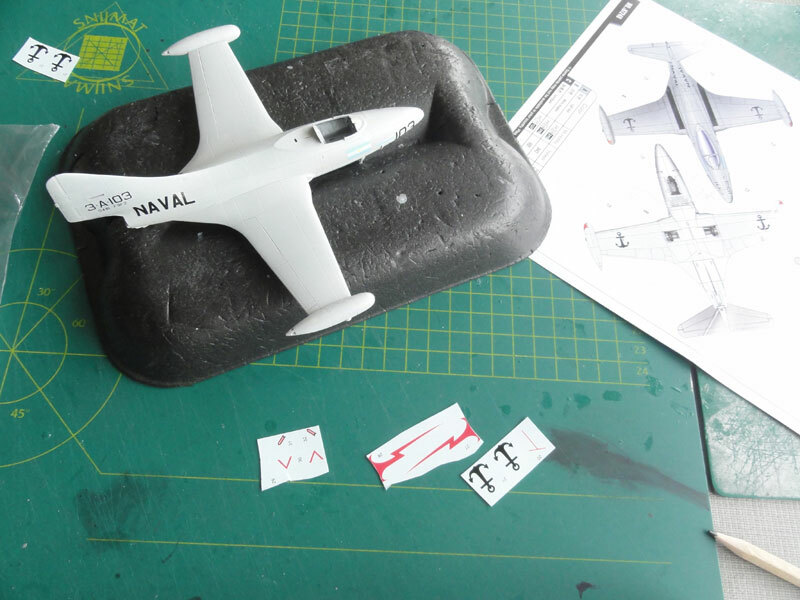 Rest of the assembly was OK. Hardly any filler is needed, only some at the rear of the wing-fuselage joint and nose. After assembly, a couple of light grey base coats were applied with the airbrush to check for any flaws that needed rework. The lower colour is white, using in this case Gunze Sangyo H1 acrylic. This was applied first with the airbrush and than masked. 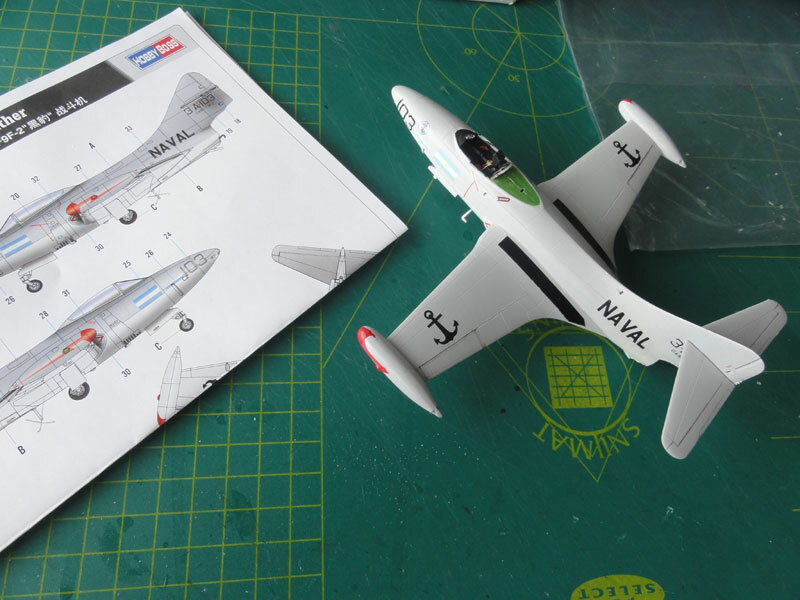 The upper gull grey Fed.Std FS16440 came from the Gunze Sangyo paint H315 acrylic. 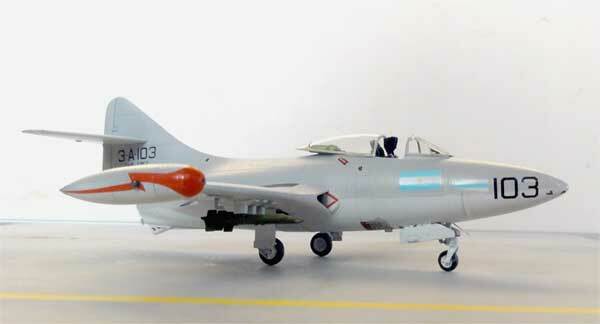 Some details were painted red such as the markings on the wing tip tanks. Also the rear trailing edge of the lower speedbrake aft the nose gear was painted red. The undercarriage legs I painted white with silver oleos (though not sure). 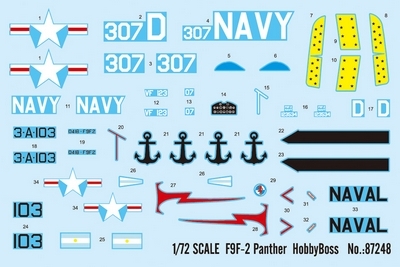 Decals were used from the Hobbyboss kit for the Argentine Navy. They are fine and show the Aero Naval "anchors" as markings. 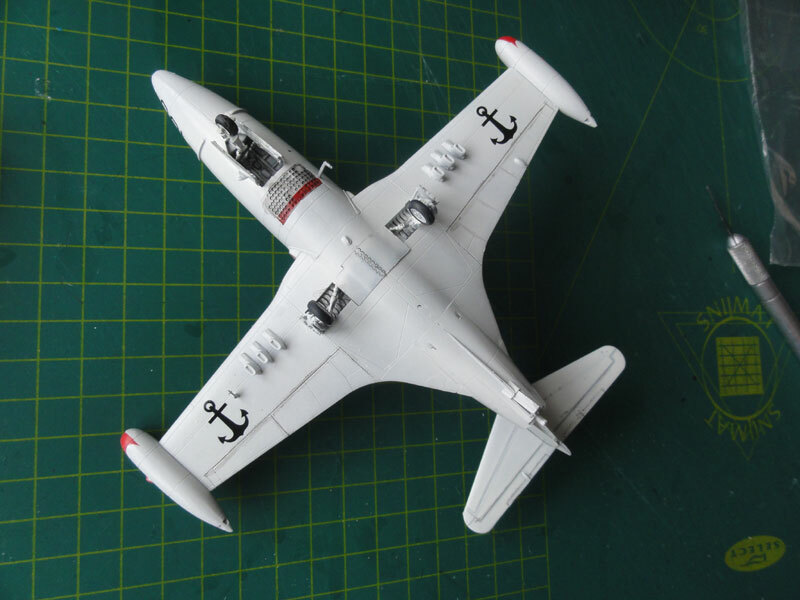 After decalling, details like the undercarriage were set on the model such as the unguided rockets. Overall a gloss transparant coat was airbrushed onto the model of Johnson Future/Pledge varnish. Anti-collision lights were painted on the wing tip tanks. That canopy was installed set open after it got a central rear view mirror and that completed the F9F-2 model. 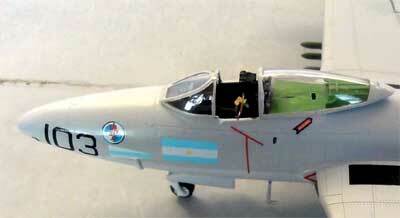 Argentina set up a rather large Naval Aviation force. First established in the 1920s with Italian assistance some Italian aircraft were flown. In the thirties types were Supermarine Walrus, Southampton and several Fairey aircraft. After the Second World War Catalina's and Goose aircraft were operated with from 1956 Corsair fighters with some Neptunes. From Britain in 1958 HMS Warrior was acquired second hand and Trackers and Corsairs began to fly from 1959 off this carrier that was now named the "Independencia". At the same time, the Aviacion Naval bought 28 second hand ex-USN F9F-2B Panthers capable of firing rockets and dropping a few bombs. 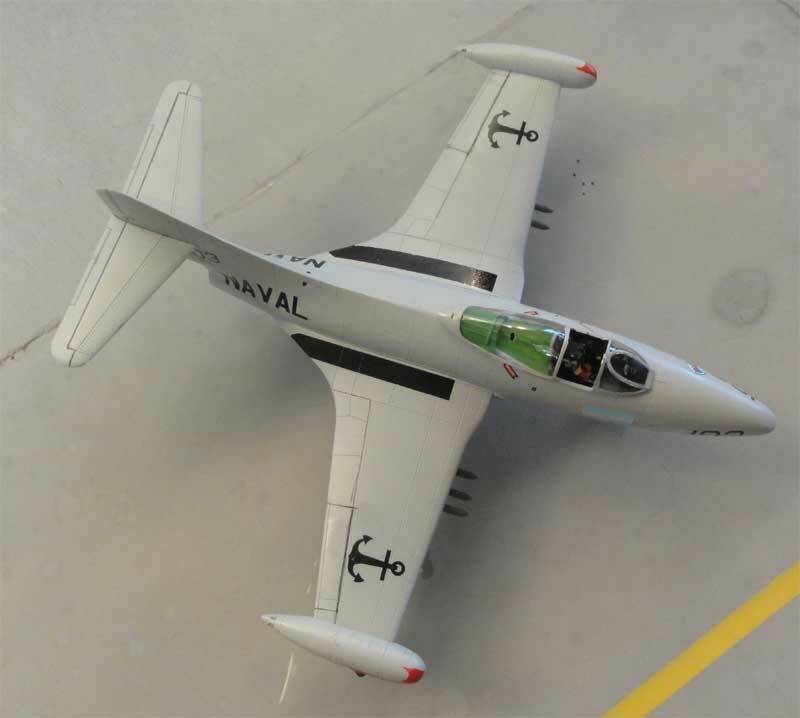 The first batch of 10 arrived in 1958 and 24 aircraft were eventually put in service and 4 used as spares. The Panthers were operated from land bases, as the carrier Independencia had insufficient catapults. 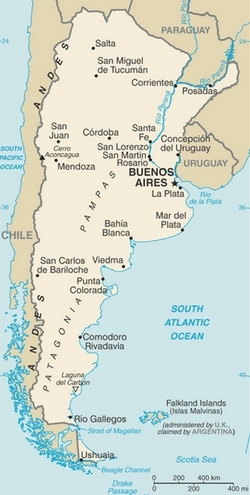 They were used in local conflicts like a Revolt in 1963 and deployed in a border conflict with Chile in 1965 flying from Rio Gallegos air base. 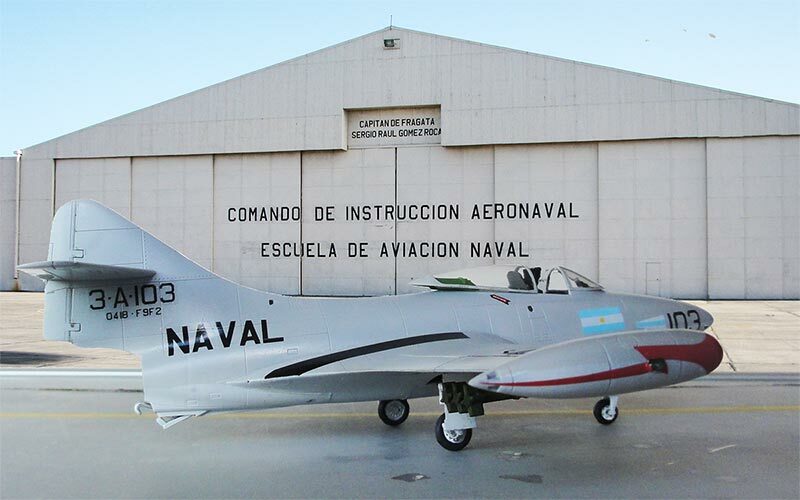 The Panthers flew with the "Aeronaval Argentino" until 1969 as from 1966 ex-USN A-4 Skyhawks were being introduced (probably a total of 16 A-4Q aircraft). End 1960's also an ex-British carrier HMS Venerable (of the Colossus Class), that was transferred in 1948 and owned by the Dutch navy "Koninklijke Marine" known as the second Hr.Ms "Karel Doorman" R81, was acquired. (The Dutch Naval Flying service flew from the Hr.Ms. Karel Doorman with Sea furies, Fireflies and later, after it got a steam catapult and angled flight deck, from 1958 with Sea Hawk jets and Grumman Avengers). After a large fire in april 1968, the "Karel Doorman" was put out of service by the Netherlands Navy and the carrier was purchased by Argentina. It was repaired and named ARA "Veinticinco de Mayo" or "25 de Mayo". It became the flag ship in 1971 and was capable of operating the A-4Q Skyhawk jets. Also Trackers were flown in the anti-submarine role. The "25 de Mayo" carrier went out of service mid 1986 and the current "aeronaval" types are flown from land and includes also various helicopters like Seakings, Alouette III, S-55 and Bell 47's.